There was a great deal of forensic evidence uncovered at the Nees crime scene. Most notoriously, police found a bloody palm print on the passenger side of the victim’s truck. It is significant in that the blood places the owner of the palm print at the scene and, most likely, at the time of the crime. The palm print was conclusively not matched to either the victim or Barry Beach. 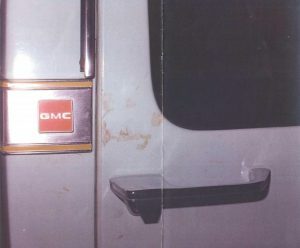 The state theorizes that an innocent passerby came upon the truck sometime after the murder (but before the scene was discovered at 7:00 the next morning by police), placed their hand in blood found inside the truck, closed the truck door, and then failed to report the incident to police. There is no evidence corroborating this theory. Despite allegations of specific individuals to whom the palm print may belong, law enforcement agencies have not sought to collect prints from such individuals. Still, the bloody palm print wasn’t the only one found at the scene. In fact, 42 sets of finger and palm prints were collected at the Nees’ murder scene. Along the bloody trail made when the body was dragged to the river, investigators identified three sets of footprints. Another footprint was found at the river’s edge where the body was discovered. The prints were made by different people. None of these hand, finger, palm or foot prints were matched to Barry Beach.